Every time I report on US tornado stats, I end up having to explain why long term comparisons are difficult to make, and why so many more tornadoes get to be reported these days. So, I am posting this up as a permanent reference document, that I can simply refer people to in future. This is the official NOAA statement. Today, nearly all of the United States is reasonably well populated, or at least covered by NOAA’s Doppler weather radars. Even if a tornado is not actually observed, modern damage assessments by NWS personnel can discern if a tornado caused the damage, and if so, how strong the tornado may have been. This disparity between tornado records of the past and current records contributes a great deal of uncertainty regarding questions about the long-term behavior or patterns of tornado occurrence. Improved tornado observation practices have led to an increase in the number of reported weaker tornadoes, and in recent years the number of EF-0 and EF-1 tornadoes have become more prevelant in the total number of reported tornadoes. In addition, even today many smaller tornadoes still may go undocumented in places with low populations or inconsistent communication facilities. With increased national Doppler radar coverage, increasing population, and greater attention to tornado reporting, there has been an increase in the number of tornado reports over the past several decades. This can create a misleading appearance of an increasing trend in tornado frequency. To better understand the true variability and trend in tornado frequency in the U.S., the total number of strong to violent tornadoes (EF3 to EF5 category on the Enhanced Fujita scale) can be analyzed. These are the tornadoes that would have likely been reported even during the decades before Doppler radar use became widespread and practices resulted in increasing tornado reports. 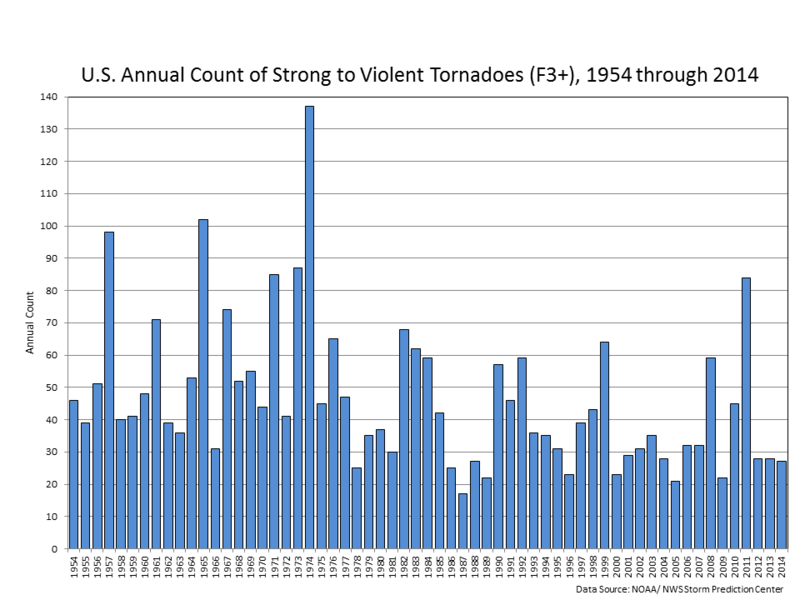 The bar chart below indicates there has been little trend in the frequency of the strongest tornadoes over the past 55 years. 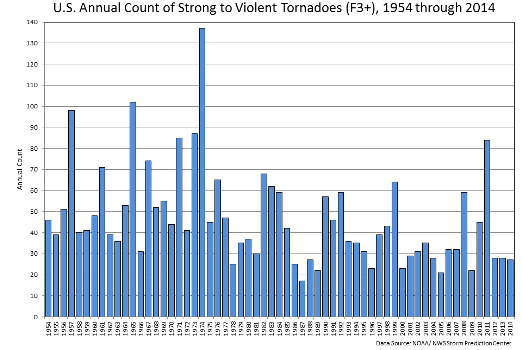 Many tornadoes, even stronger ones, occurred without being reported, even as recently as the mid 20thC. It is only since Doppler was introduced in the 1990’s that we have got a comprehensive picture. The only meaningful comparisons, therefore, that can be made are for stronger tornadoes since around about 1970. More detailed information is available from the McCarthy & Schaefer paper below. 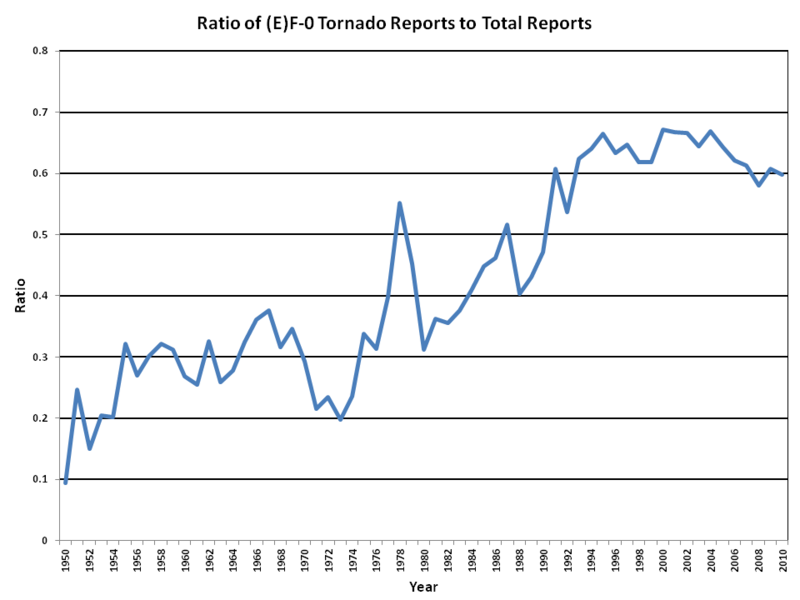 ← Don’t Mention Low Tornado Numbers–It’s Not Fair!!! Bar graphs are a bit clunky, I think the long term tendencies are more readily visible in a conventional line graph. Here are stronger storm data for EF2+, EF3+ and EF4+ groups. There seems to be a clear pattern : cooling period has more tornadoes warming period less. If NOAA see “little” trend, it’s wilful blindness, there is a clear relationship and it is the opposite of AGW scare story of “more frequent and violent storms”. Warming causes less tornadoes. Also I don’t see any justification here either in the data or that NOAA quotes for suggesting a 1970 cut-off date for “meaningful” comparisons. It is not clear why you state that. For that reason they begin their analysis from 1970. Long Term Tornado Trends | Watts Up With That? U.S. Tornado Intensity Index Shows No Upward Trend | Watts Up With That?